Pretty exciting, huh? Let us know what are you most looking forward to. While the new plans look exciting, ya’ll are missing a crucial piece of the puzzle. The ADVENTURERS CLUB should live on! It was Always packed in there, so it seemed profitable. The “problem children” that went to all the dance clubs did NOT venture into the AC. We have fond memories of the place….it was where we took our friends AFTER our Disney Wedding in 2007, etc. Magical Days for all of us! Wow! I haven’t seen this many comments since one of the Moms Panel blogs which had 157.
the artwork of the remodeled area is beautiful. However, what I see lacking is the uniquelly “Disney” experience that set Pleasure Island appart from other outdoor malls, and therefore made me want to spend time – and money – there. That would be the clubs, especially Adventurer’s Club. Please include the Adventurer’s Club as a part of this ambitious project, and raise the grade from a C to an A+. Many different attractions at Disney have come and gone. One of the most famous is Mr. Toad’s Wild Ride. It happens. Nobody thinks Disney World should stay unchanged. I don’t know that anyone ever organized a 2-day Disney World convention for well over 100 people to celebrate Mr. Toad’s Wild Ride. But I do know that for 2 years now, several thousand dollars were spent by people that simply wanted to remember a place where they could gather with friends, sing songs, and tell stories, and feel like they were part of something that had never been attempted anywhere else on earth. I had visited WDW in 2006 and 2007 but never went to PI because I didn’t really know what it was about. I first learned about the Adventurer’s Club when I read it was closing. After hearing so much about the Club I had to go and check it out for myself. We visited the Adventurer’s Club during our trip in August 2008. I spent a wonderful evening with my two teenage sons laughing the night away – something that does not happen often. And because we had such a good time I left there feeling sad knowing we could never come back. I LOVE WDW and I LOVE spending time in the parks. But when the parks close, I don’t want to go back to my room (and I don’t want to go shopping). I want to be out with other people. And it would be GREAT to be able to spend the evening with other Adventurer’s. PLEASE, PLEASE, PLEASE bring back the Adventurer’s Club! This place looks really cool but nobody will be interested in it if its just more restaurants. People want to see something uniquely Disney and if new concepts can’t be created, at least return The Adventurer’s Club! Please return The Adventurer’s Club with this make over. It’s an absolute Disney masterpiece that people are demanding to experience again! Without the Adventurer’s Club it will just be the same old retail/food distribution I can get anywhere. When you bring back the Adventurer’s Club you will finally bring my family back to the island or “wharf” area. Adventurers Club was one of the most Disneyesque experiences I’ve ever experienced. Immersive, creative, animatronics, escapism, an experience dependent on the dedication of the cast members. Why oh why won’t it come back? 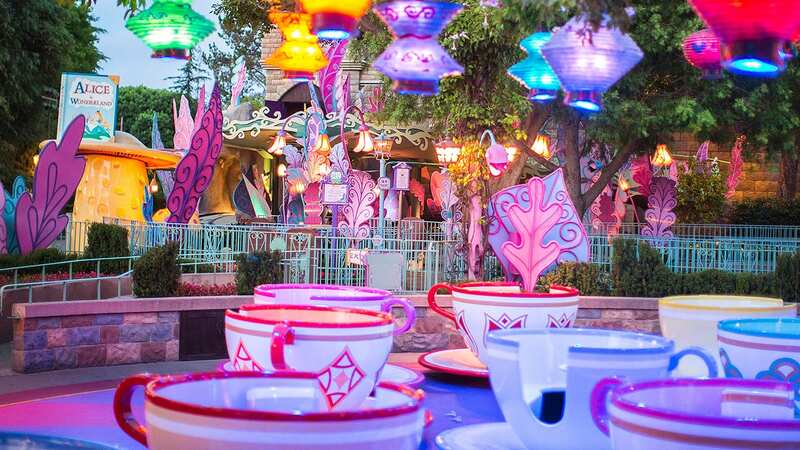 It is one of the few places that adults were able to get that same feeling of a child who is able to immerse themselves in their own make believe world. Personally, I don’t need more stores and restaurants (although it’s nice that Disney’s getting the rent paid, I guess). Bring back the Adventurer’s Club! I hope you add a jamba juice!! Please bring back the Adventurer’s Club as part of this new area. It was fun for the whole family and was always a highlight of our trips. 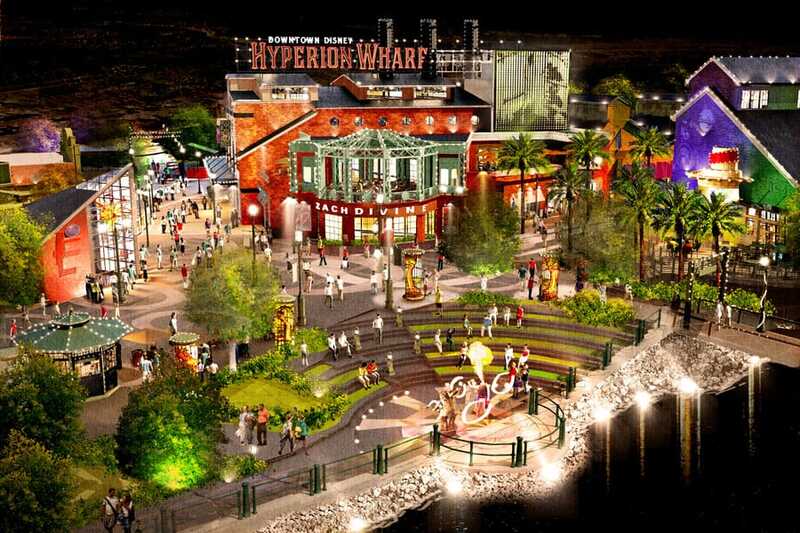 That kind of interactive entertainment experience would certainly draw us to Hyperion Wharf. Please, Please, Please! Bring back The Adventurer’s Club! We can go to a mall any time at home. The Adventurer’s Club is the kind of unique and captivating attraction that Walt would have loved. Looks interesting- too bad they haven’t included a new Adventurer’s Club. I didn’t get to experience the Adventurer’s Club until 2007 and I’m soooooo thankful that I got to before it closed. Please bring back this jewel! Obviously for those who have been, they know how great of a place it was. I have to agree with a number of fan posts here. The Adventurers Club need to come back!!!! My husband an I spent ALOT of time there on every trip! It would also fit the concept. Kongaloosh to all Club members!! Sounds to me like the Adventurers Club would fit into this new vision quite nicely! I’d also like to say that, after having Disney strip us of so many beloved places *cough* Adventurer’s Club *cough* in the once Pleasure Island, I really, really hoped they would give us something even MORE magical to take its place – as they promised. This is a huge letdown. Huge. And not just because the Adv Club is nowhere in the plan. It’s a disappointment because there’s nothing unique in it. Anywhere. There was a day, and it wasn’t all that long ago, that Disney held itself to a higher creative standard. I registered JUST so I could post this: PLEASE BRING BACK THE ADVENTURER’S CLUB. Closing it was the worst mistake you’ve ever made, Disney. I’ve been to Downtown Disney a couple of times since PI closed and there’s just.. nothing there. I was hoping something in your new plan would look interesting/exciting, but it doesn’t. It’s just more of what I can get any number of other places. I’m disappointed. I think we would all rather have the Adventurers Club back than pretty much anything else. I haven’t been to Downtown Disney since it closed, and I live 5 minutes away. The new area really looks good, but isn’t there ANY way to rehab the front so that the building fits in and PLEEEAAASSSEEE keep the Adventurer’s Club! It waS FAMILY ENTERTAINMENT AT IT’S VERY BEST! because we’re daring through and through. Hyperion Wharf at the moment looks pretty, but not much more. I, along with so many others commenting here, was saddened by the loss of the Adventurers Club and would be thrilled to see it return. I’m glad to see that, two years later, I’m clearly not alone. Judging by the comments here (and the unique Disney qualities of the Adventurers Club), it seems that with some marketing and merchandise, it would be a real money-maker and a perfect addition to Hyperion Wharf. I have to add my voice to the chorus of bring back the Adventurers Club. I’ve had no use for anything west of the World of Disney since you closed the club. It was great to have something to do on nights when the parks closed early. Shopping and dining doesn’t do it, we have way better restaurants and shops in Chicago, no need to leave town for that. But, the Adventurers Club was truly one of a kind. A reason to spend more money after a day in the parks. KUNGALOOSH!!! Bring back the Adventurer’s Club!!!!!! Looks wonderful…but I agree with the others…is there any chance you guys will bring back the Adventurer’s Club. The Club is truly what you all are interested in right now which is interactive entertainment. (I mean, isn’t that why you’re designing queue lines with interactive qualities to them now?) This is the epitome of entertainment that is different every time you go. It truly was a shame when you decided to close the club down. My trips back to Disney World have simply not been the same since. I must have been a little too vocal as well, so I’ll try to express this here again this way: As a Disney shareholder I hope Disney takes notice of the six pages of comments here and responds to the wants of the Disney fans who have replied here. Kungaloosh! Clubs please. Make them as you wish as long as there is a place to dance and socialize till 2 AM. We all miss this so very much! Must have been a little too vocal on my first comment attempt. Plain and simple. Nice idea. Could be a great idea if the Adventurer’s Club is included. 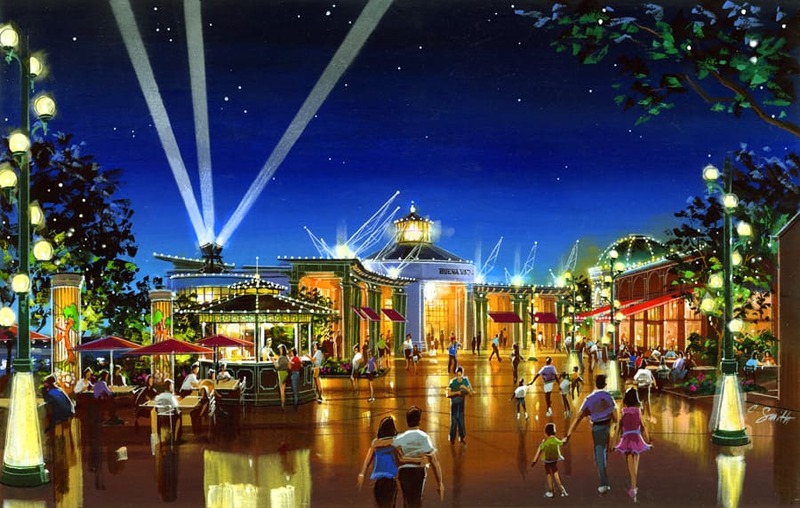 Thanks to the sharp-eyed Disney fan who tweeter about spotting the Adventurers Club in the corner of some of the new Hyperion Wharf concept art, to the left of the balloon and Paradisio. Kungaloosh! You know what would make this perfect? The Adventurers Club. When the Adventurer’s Club closed my husband and I lost our hang out place. I really hope it is coming back. Hopefully whoever writes this blog actually takes the time to read some of the comments, but I seriously doubt that he will. IF the PTB’s at Disney planning ever took the time to read the comments posted here, they would realize The Adventurer’s Club still has a HUGE fan base. Bringing it back is a subject that crops up every single time Disney announces ‘New Plans’ for the now defunct Pleasure island area of DTD. I miss the Adventurers Club. I miss the fun, the laughs, the characters, the LIBRARY. If you feel the need to make everything at WDW ‘family friendly’, you are doing a grave disservice to the adults with no children who love the parks but feel the need for some ‘adults only’ fun. Bring back the Adventurers Club…make it open to all ages until 9 or 10 pm. Then let the over 18 crowd have some fun, PLEASE?!?!?!?! Please, please, PLEASE bring back the Adventurers Club!!! I miss it so much! We go every year and we still go by “the remains” each year, hoping that we will see you are bringing it back. Add my vote for the return of the Adventurer’s Club. If not at Hyperion Wharf then somewhere else. I’d even be OK with it if there was no alcohol served. It just needs the Adventurers to make it perfect!We came all the way from England looking forward to our night in there and it had vanished – we were gutted. Please, bring back Kongaloosh! We do not need more outsourced Restaurants. Bring back some real Disney Entertainment. The Adventurer’s Club. I took my 2 nephews there before it closed and they Loved It! The only wish my nephews had was to visit there again and now it is gone! Stop outsourcing your food and entertainment. We want the Disney Cast experience! 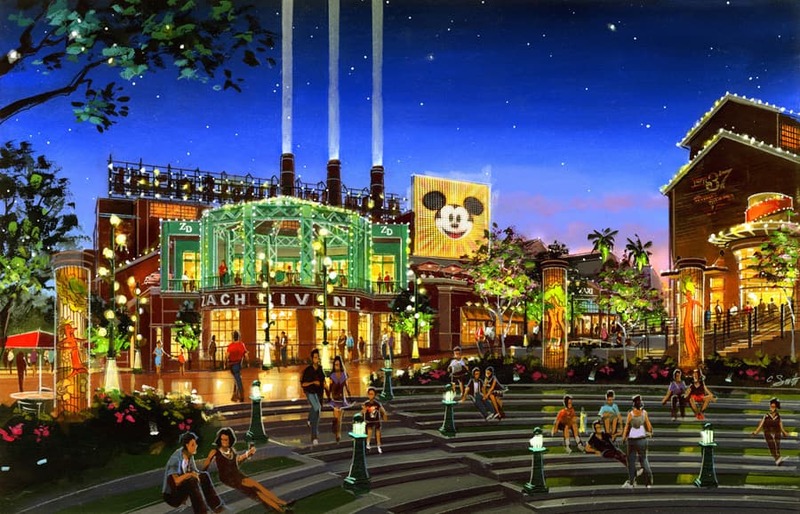 This will be awesome to see and Downtown Disney will have alot of workers! I love it! For nearly 20 years, Pleasure Island gave adults a place to play. These pretty pictures are no substitute. Please do not ignore us. We have $$ to spend in a re-imagined Mannequins. Up or down, north, south, east or west you made the Adventurer’s life the best! Please give it back. It looks very pretty, and I’m sure it will turn out quite nice…but I mourn the loss of the Adventurer’s Club. It was a GREAT “Disney” experience that you could find nowhere else, and it was a nice spot to go after a long day of enjoying the parks with my kids. I hope Disney finds a spot for AC in this new redesign, but I fear that hope is misplaced. One of the best memories I will ever have at Disney, is when my wife and I went to the Adventures Club. This in my opinion was the BEST the Disney had to offer in P.I. I HATE that that it was closed. I beg you Disney re-open the club in the Wharf or somewhere else!!!! I agree fully on bringing back the Adventurers Club, it would fit perfectly with the new theme and would be a welcomed change to bring back some Adult entertainment to the resort. Please bring back the Adventurer’s Club!!! All that PI has become to me is an annoying obstacle course between the other 2 parts of Downtown. Last night, when there were about 200 posts up, I counted the “votes” for Adventurers Club. More than 140 people responded asking for the club’s return. That number has grown overnight. I hope you’re listening Disney. Kungaloosh!